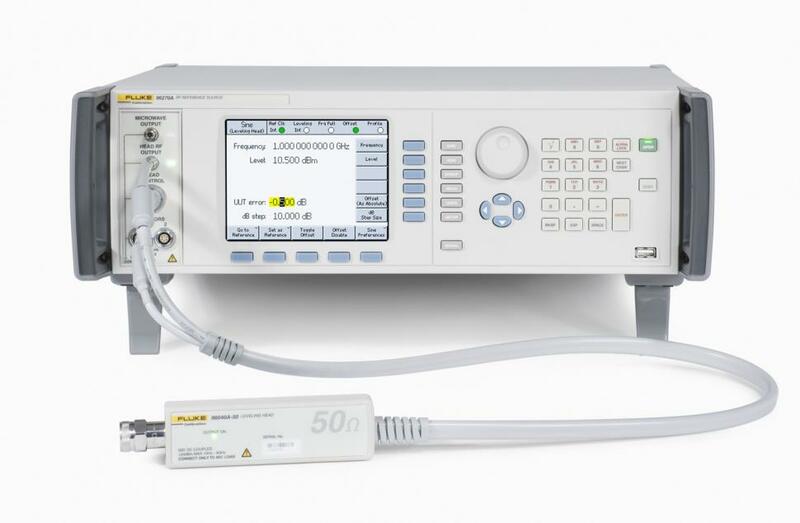 The Fluke Calibration 27 GHz 96270A RF Reference Source is the simplest, most accurate and cost effective single instrument for calibrating spectrum analyzers and RF power sensors and more. Its precision signal level and attenuation, high signal purity and precision low distortion modulation make this reference source clearly superior to the general-purpose signal generators that are often used to calibrate spectrum analyzers, RF power sensors, attenuators, and similar instruments. Its low phase noise provides superior phase noise performance. 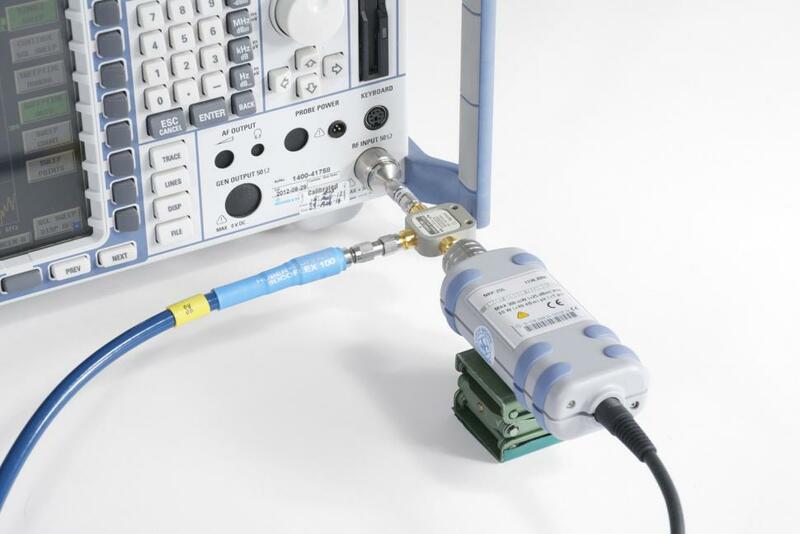 Unlike many RF calibration solutions, the 96270A is designed specifically for RF calibration, with a calibration oriented user interface that makes it easy to learn and operate. The 96270A simplifies and speeds up calibration procedures, reduces opportunities for operator errors, and greatly simplifies RF metrology. 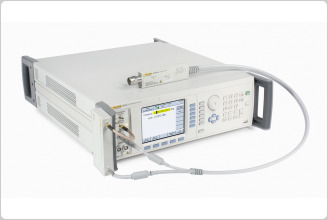 At the core of an RF and microwave calibration system, the 96270A covers more than 80 % of the test points required for calibrating almost all spectrum analyzers of any frequency range. For many spectrum analyzer models operating below 27 GHz, you only need a 96270A to perform the entire calibration. You can’t simplify much more than that! Automated with MET/CAL® Calibration Management Software, the 96270A reduces complexity and calibration times, improving efficiency and increasing capacity over manual methods. The metrology associated with calibrating these items becomes simpler because you have fewer error sources and uncertainty contributions to consider than with traditional RF calibration systems. The 96270A delivers pure, accurate level signals directly to the UUT input just the way you set them on the front panel. This unique “What you set is what you get” feature helps you avoid losses, mismatch errors, and uncertainty contributions introduced by cables, other devices and interconnections, eliminating complex setups and time consuming methods otherwise required to obtain accurate results. For low-level signals, use the 96270A with the rugged, precision leveling head in 50 ohm or 75 ohm versions. The head delivers lower frequencies up to 4 GHz directly to the UUT input with deep dynamic range, minimizing losses, noise, interference and mismatch errors, and maintaining the integrity of low-level signals throughout a 154 dB dynamic range, down to the very lowest levels at -130 dBm. For more shallow level wider frequency range signals up to 27 GHz, use the 96270A with the microwave output with the high frequency leveling kit to realize the “What you set is what you get” signal delivery and accuracy benefits. The 96270A can “self-characterize” or profile its output to account for losses and attenuation of system components like cables, attenuators, splitters, and connecters, effectively creating a signal reference plane directly at the connection to the UUT input. This frequency/amplitude level correction profile is saved into 96270A memory, which can store up to 30 profiles for different output and interconnection configurations. Using a profile, the 96270A applies the level correction data automatically and delivers the user’s signal level setting accurately at the reference plane created at the UUT input. As a result, you save time, because you don’t have to measure, calculate and apply correction factors for each component in the signal delivery system. Many applications in R&D, manufacturing test and ATE need better performance than a general purpose signal generator can offer. If wide frequency coverage, frequency resolution, low harmonics, phase noise and spurious content, signal level and attenuation accuracy, and/or dynamic range are critical parameters, the 96270A is the ideal solution. The 96270A not only reduces the initial cost and time to purchase, install and configure RF system components, but it also reduces the costs to maintain and calibrate all of that equipment. For many spectrum analyzer models operating below 27 GHz, as well as for most power sensors, you only need a 96270A to perform the entire calibration. The 96270A is also easier to transport than a heavy rack of equipment and accessories, making it the optimum solution for on-site calibration. The integrated dual power meter readout enables you to use the 96270A as a power meter and perform RF calibrations, without requiring a separate power meter. You can replace the 40 GHz power sensor included with the 96270A/HF model with a different compatible model, for power measurements at frequencies up to 67 GHz. 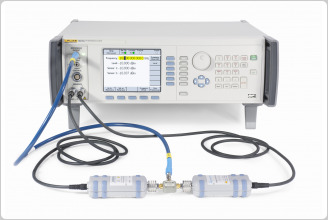 The 96270A Reference Source’s internal modulation capability makes it suitable for applications that require precision modulation to be applied to the output signal, such as modulation analyzer calibration and spectrum analyzer sweep time testing using an AM signal with more accurate modulation rates. You don’t need additional function generators as a low frequency modulation source—the 96270A delivers it all. The integrated 300 MHz frequency counter lets you reduce the number of instruments required for RF calibration even further. Many RF calibration systems are assembled with a mix of general purpose signal generators, power sensors, and other non-calibration-specific instruments. The 96270A, on the other hand, is designed specifically for RF calibration. Its user interface is designed to simplify processes for calibrating items such as spectrum analyzers, RF level meters and receivers. Parameter offset, stepping, relative and UUT/DUT error readout modes allow you to work accurately and efficiently, following familiar calibration procedures. You’ll find it easier than ever to determine the performance and tolerances of units under test. The 96270A front panel is equipped with dedicated function keys, context-sensitive softkeys, and a bright, easy-to-read color display that make levels in terms of power (watts or dBm), voltage (RMS or peak to peak) using familiar multipliers and exponent forms. You can move easily between voltage, power and dBm units without losing entered values or accuracy. In error readout mode to adjust the reading, simply rotate the spin wheel and the UUT error is displayed directly in dB, ppm or percent. The simple, calibration-oriented user interface also makes troubleshooting easier if you encounter an unexpected result or an out-of-tolerance condition while following a manual or automated calibration procedure. With low phase noise optimized for low and high offset frequencies, and specifications from 1 Hz to 10 MHz offsets, the 96270A offers exceptional phase noise performance beyond that required for today’s high performance workloads. Phase noise data is included in the 96270A certificate of calibration. Instead of relying only on the more conservative guaranteed specifications, users have actual performance data for their unit. A variety of models, options and accessories enable you to purchase the performance you need, then add items later as your needs change and grow. The basic 96270A Reference Source comes with a 50 ohm leveling head. The 96270A/75 includes both the 50 ohm and a 75 ohm head. The leveling head provides leveled, deep attenuation, modulation and low phase noise signals to 4 GHz, covering 80 % of the test points of any frequency spectrum analyzer—including high frequency models—and for linearity calibration of power sensors. Signals at frequencies from 1 mHz to 27 GHz are also available from the 96270A front panel microwave output, at level accuracies comparable with most general purpose signal generators. 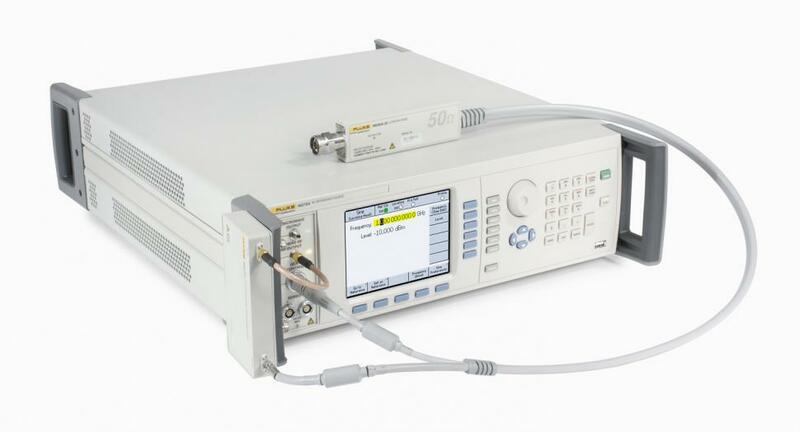 The 96270A/HF Reference Source includes a high frequency leveling kit comprised of a Rohde & Schwarz 40 GHz power sensor and Agilent 11667B splitter, plus a metrology-grade microwave cable and precision APC-3.5 millimeter adapter. This configuration, using the 96270A Microwave output, enables you to calibrate spectrum analyzers, power sensors and high frequency oscilloscope bandwidths in the 1 kHz to 27 GHz range. The power sensor and splitter provide the 96270A with fully automatic feedback that enables it to deliver precision, leveled, high purity signals, just as you set them on the 96270A front panel, at the splitter output port reference plane and UUT input connection. The 96270A/LL Reference Source with Low Level Microwave Output extends the microwave output range from -4 dBm at the front panel connector (-10 dBm at the high frequency leveling kit splitter output) down to -100 dBm, for applications that require lower level signals at frequencies up to 27 GHz. This capability is invaluable for calibrating oscilloscopes, as well as for some spectrum analyzer and power sensor tests. The 96270A/LL/HF includes both the high frequency leveling kit and the low level microwave output, for the broadest possible workload coverage. The 9600FLT 1 GHz Wide Offset Phase Noise Filter accessory is designed specifically for high performance spectrum analyzer wide-offset phase noise testing. Even with the best low phase noise signal generators, technicians occasionally use filters during very high performance spectrum analyzer phase noise tests to reduce noise levels at wide (high) offset frequencies and to improve test margins. The 9600FLT connects easily to the 96270A in either benchtop or rack-mounted applications. The 96270A mainframe and leveling head are calibrated together as a complete system to assure overall system performance. 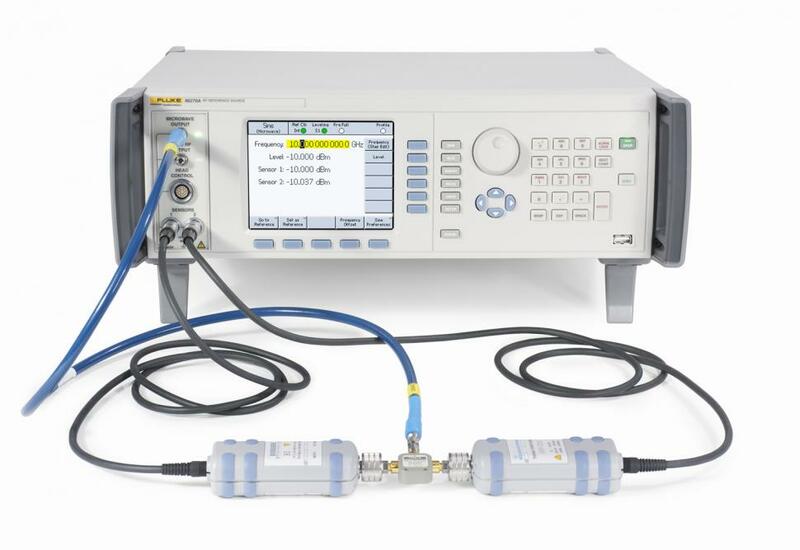 Each 96270A instrument is supplied with a comprehensive ISO 17025 compliant certificate of calibration with data for all key parameters, including level and attenuation, leveling head output VSWR, and phase noise. You can be assured that your 96270A is traceable, plus RF metrology and uncertainty analysis become much simpler and faster. Accredited certification is available for the 96270A and both 50 ohm and 75 ohm heads. Selectable external frequency reference input is available as a standard feature on the rear panel of the 96270A. The input allows you to lock the frequency output to an external reference, such as the Fluke Calibration 910R Rubidium Standard, for applications where high clock accuracy or use of a common reference frequency is important. The frequency reference output allows a UUT to be frequency locked to the 96270A internal reference clock. This configuration is often required to reduce frequency offset errors that may occur between the reference source and the UUT. RF applications often require a frequency sweep. The 96270A’s sweep functions simplify the application of manual legacy spectrum analyzer frequency response testing, as well as filter response measurements. In a typical automated RF calibration process, the operator must intervene frequently to change test setups, thus limiting the benefits that can be realized by the automation. Walk-away automation can increase calibration system capacity by 25 percent or more using procedures developed in MET/CAL Calibration Software. Fluke Calibration includes a sample calibration procedure with the 96270A, which you can use as the basis for creating additional RF calibration procedures to handle your unique workload. MET/CAL procedures created by Fluke Calibration for the 9640A models can also be used by the 96270A. The 96270A can be integrated easily into existing automated systems and software. The time savings and efficiency gains offered by the 96270A can be realized by structuring test sequences to take full advantage of its “connect once, test many” capabilities. *Key specifications summary. Refer to the 96270A Extended Specifications for detailed specifications, including the 75 ohm output Leveling Head.